Monotony was the hardest part of a yearlong NASA experiment about the mental and psychological rigors of longterm spaceflight, crew members said after the test ended. 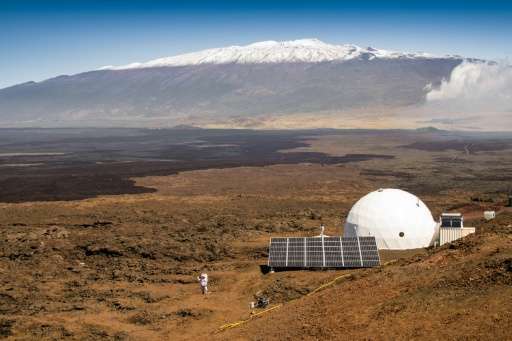 The six-member crew emerged Sunday from a dome in Hawaii, on the barren northern slope of the Mauna Loa volcano, where they were studied as part of the US space agency's mission to send people to Mars by the 2030s. On Monday, US President Barack Obama congratulated them, writing on Twitter: "Congrats to NASA and the scientists taking us a step closer to Mars. Now enjoy Hawaii and get a shave ice!" In addition to insufficient stimulation, isolation and a lack of fresh food and air were the toughest challenges during the yearlong experiment, known as the Hawaii Space Exploration Analog and Simulation (HI-SEAS)—the third and longest of its kind. The team locked themselves into the dome, located in an abandoned quarry far from animals and vegetation, on August 28, 2015. "We were always in the same place, always with the same people," said French astrobiologist Cyprien Verseux in a Periscope interview by organizers posted on Twitter. The crew lived inside a structure 36 feet (11 meters) in diameter and 20 feet tall, emerging only if outfitted in spacesuits, never breathing the outside air or eating fresh produce. Despite describing the monotony as the hardest part, Verseux said the experiment shows that "a mission to Mars in the close future is realistic." He said a key hurdle involves producing food and a small-scale ecosystem on Mars, where the atmosphere is thin, the ground dry and water is scarce. The experiment did not test the process of growing food, but was aimed primarily at the psychological study of the crew. "The technical and psychological problems can be overcome," Verseux said. Video footage of the team as they emerged shows the three men and three women looking a bit bewildered as they met visitors and well-wishers and posed for selfies. Organizers gave them fresh fruit and vegetables. In interviews, the crew was upbeat but made passing references to arguments and growing tired of seeing the same faces. Verseux's advice to new volunteers on a similar isolation experiment: "Bring books." Another mission member, American Tristan Bassingthwaighte, agreed, urging future participants to bring "lots of books." Bassingthwaighte said that team members engaged in hobbies such as salsa dancing and playing the ukelele to stave off the boredom. "If you can work on something that is self-developmental... you will not go crazy," he said. The men and women had their own small rooms, with space for a sleeping cot and desk, and spent their days eating food like powdered cheese and canned tuna. The dome had composting toilets and showers, and was powered by solar energy. Team members had limited Internet access. Team members could venture outside only in spacesuits, and Bassingthwaighte said that the "astronauts" removed a vast amount of garbage from the flanks of the volcano in their excursions. Christiane Heinicke from Germany said that her main experiment was extracting water from the ground—adding that the volcanic soil on Mauna Loa is very similar in mineral composition to the Martian soil. "You can actually get water from a ground that is seemingly dry," she said. "The implication is that you could get water from Mars." She said that having "something meaningful to work on" was key to helping her endure the year-long mission. However, she also spoke of the difficulties of living in close quarters with the same group of people for a long time, and said she planned to stay in close contact with only three of the other five. The crew also included a pilot, a doctor/journalist and a soil scientist. The full analysis of the team's psychological performance has yet to be revealed, but it is expected to be published in the coming months. "We are just starting the debrief week," lead researcher Kim Binsted told AFP by phone from Hawaii. "They didn't break the simulation, they did all the things we asked of them, and all of those things are pretty good signs," she said. "It certainly wasn't worse than expected. Every crew has conflicts." NASA is studying how these long-term isolation scenarios play out on Earth before pressing on toward Mars, which the US space agency hopes to reach sometime in the 2030s. NASA can currently send a robot to the Red Planet in about eight months, but astronauts traveling to Mars face a trip lasting between one and three years. The first HI-SEAS experiment involved studies about cooking on Mars and was followed by a four-month and an eight-month cohabitation mission. Two more HI-SEAS missions are planned starting in January 2017 and 2018. Both are scheduled to last eight months, and organizers are already looking for volunteers. Instead of wasting good people on useless experiments it would be better to actually send them to Mars (and beyond). Re boredom, I suggest that a more judicious selection process would be in order, as we are talking about the survival of the human race here. So we should spend a couple of billion to send people to Mars just to find out that that some trivial thing - that could have been tested for with something like the above experiment - dooms the entire thing to failure? Yes bring them back so they can get their medals and do parades and talk shows. More governments are messing with em Ion drives and the like, which cuts transit time to about 1.5-2 months, max. Thus the window for mars travel to and fro...also opens up. Elon lifts it all into orbit ....and then em-ion takes over from there. This is starting to shape up. Oh yes, with the short transit time and a bigger window, a true back and forth stream can emerge. As long as we are still intent on subsidizing foreign oil purveyors with the bodies of our astronauts by putting them in artillery shells and sending them to certain death in tin cans, we should at least keep them here instead of murdering them for Arab oil profits that only go to ISIS. So what if that large fancy TENT is not really preparing anyone. If we really want to go there, build a really large comfortable ship and propel it with M2P2 or plasma thrusters all nuclear or better yet fusion powered. That way we send a crew that can really live in space, can operate independently, can recover from problems and fix equipment, can shelter from space weather, and can arrive at in system destinations within weeks and not years. We can also design a ship with some kind of 'gravity' even if it is the rotational kind, so what arrives are not invalids capable of ...not much on any planet. "Instead of wasting good people . . ."
A program for sending people to Mars is an expensive and risky undertaking. Minimizing the risk through experiments like this is to be expected. Thus, these efforts are not a waste. "we still have no technology for their safe return"
The leading candidate is simply a rocket that makes most of its fuel from local (in situ) components on Mars, e.g. atmospheric carbon dioxide.. In his Mars Direct approach, Dr. Zubrin described an Earth Return Vehicle (ERV) fueled with in-situ derived propellants in his 1990 research paper and in his 1996 book. NASA has appeared to favor a "Mars Semi-Direct" approach in its Design Reference Missions studies, which uses two vehicles instead of one, a Mars Ascent Vehicle (MAV) and a Earth Return Vehicle (ERV) parked in Mars orbit. "US auditors question NASA Mars plans"
That is the logic of failure. It implicitly ignores any societal value of going to Mars. "More governments are messing with em Ion drives"
It will take a lot more than lopsided microwave ovens from Walmart to create a propulsion breakthrough. The proposed physics there does not work. The better approach is evolve and develop the technology we have, i.e., chemical, ion and nuclear. We should also continue to lay the groundwork for more advanced technology like fusion and antimatter. Finally, we need to watch for breakthroughs (negative energy? ), but be very wary of shams like em drive. Oh come on mark. Look something up for once. It will actually make you look smarter. "Oh come on mark. Look something up for once." Sorry, but I looked and found no merit in it. The initial test setup in 2002 was a lopsided 850 watt microwave oven. One giant problem is that the inventor's explanation violates the principle of Conservation of Momentum and Newton's Third Law. It is nonsensical to think that simply having one side more steeply slanted than the other in a closed oven will produce magical thrust with microwaves. It would make better sense to simply open the door of the oven. Another giant problem is the inventor has been milking this since 1999 and nobody has made anything useful out of it. We need stuff that actually works, not frauds like em drive. "Inventors have not reliably demonstrated thrust from Em drive designs and few scientists take the claims about these designs seriously." Yeah and if you had read beyond the first few paragraphs you would have seen that many are still working on it, including theories which may not violate classic laws, some have gotten positive results, and nothing conclusive has been found. Jumping to premature conclusions definitely does not make you look smarter. "Jumping to premature conclusions definitely does not make you look smarter." Not trying to be premature or look smarter. Another troublesome part is that the proposed momentum gain is thousands of times that to be gained from simply opening the oven door. How is such an amplification achieved by keep the door closed? This probably violates Conservation of Energy too, which puts you in the fantasy land of perpetual motion machines. You are correct about people looking into this, because they are diligent, but the amount of thrust is so tiny all sorts of experimental error may come into play. If folks really believe we can go to Mars or Proxima Centauri with this, why not scale up to at least the ~5 Newton level? Let's see some real thrust, not just microNewtons. When we prove this thing won't scale, it is almost certain the reason is experimental error. -which is certainly jumping to conclusions isnt it? -So not only are you jumping to conclusions, you are making uninformed claims. It is not premature or incorrect to favor hard science over wishful thinking. If you want to believe the em drive will carry us to the stars and the known laws of physics I cited are wrong, feel free, but the rest of us refuse to believe unless sufficient evidence is presented. This em idea has been out there since 1999, so why don't we have more than a wimpy microwave oven-type test setup producing microNewtons of thrust? As I wrote, if folks really believe we can go to Mars or Proxima Centauri with this, why not scale up to at least the ~5 Newton level? Let's see some real thrust, not just microNewtons. When we prove this thing won't scale, it is almost certain the reason is experimental error. I take it you believe in cold fusion as well. It is just those pesky governments that have conspired to hold it back, right? Of course 30 years later nobody has made anything with palladium and deuterium that actually works, including you. -he was being premature. Or immature. And he discounts all those genuine scientists at NASA and elsewhere who are still working on it scientifically, and releasing papers and so forth. why not scale up to at least the ~5 Newton level? Well heck while we're at it why dont we just build a really really BIG one and move mars a little closer to earth? Anything else you want to get done by tomorrow mark? And whos 'we'? Im pretty sure youre not on the team. Yeah Ive often said this about room temperature superconductors. It hasnt happened yet so lets give up already. Im tired and Jeopardy is on in 10 minutes. You got any other strawdogs you want to kick around? So if you dent your microwave oven by dropping it, thereby making one side more narrow than the other, do you really believe you have created a better way to get to Mars? Really? I havent created anything you retard. Why dont you bother the scientists at NASA who according to you are just wasting valuable time and money? Im sure they are skilled at dealing with cranks. The scientists at NASA are running down an error in their setup and leaving no stone unturned because em drive has become a media issue, not because they plan to use it to go to Mars. This isn't about YOU dropping a microwave oven. The obvious point is ANYONE dropping a microwave oven, making it narrow on one side, is NOT creating a better way to get to Mars. I see I see... so youve already talked to them and they now understand that the thing will never work, but they decided they need to continue to spend money and write peer-reviewed papers and waste valuable time in order to fool the public. "An independent scientist has confirmed that the paper by scientists at the Nasa Eagleworks Laboratories on achieving thrust using highly controversial space propulsion technology EmDrive has passed peer review, and will soon be published by the American Institute of Aeronautics and Astronautics (AIAA)." Your intellect sets a very low bar for the world. Youre obamasocks arent you? Banned again yes? As nice as it would be, and as much as we all would like to believe the answer to all our propulsion problems is this simple, the ugly reality is em drive will NEVER produce anything real we will use for manned space travel. I only comment here to help people with technical subjects I have some familiarity with. You obviously don't want that assistance. -Obviously reading is not one of your technical skills pussytard. "Boredom was hardest part of yearlong dome isolation"